I thought my now I'd be showing you our beautifully completed bathroom, wrong it is still sadly a work in progress but maybe soon as there is just some lighting and final fixing of controls to sort out. Meanwhile I'll tell you about the engineer and the scaffolder. A while back we had a company round to talk about scaffolding part of our building to enable a worker safely to complete the lead work surrounding our soon to be installed new double glazed aluminium windows. Yes those four windows that had been in the lounge for about a month. It's a tricky operation, we needed a tower to come up from the garden to the fourth floor over the balcony and a platform to span to the window on the other side of said balcony to protect anyone working on the windows. As an extra precaution the worker would be harnessed to the balcony. Mr FF had of course done all the calculations for the structure and it was feasible, the scaffold man agreed and gave us a price, fairly costly but we thought worth while. In actual fact the lead work to the building isn't our responsibility but we were prepared to fork out for it just to get the job finished and risk retrospective installation that might damage our windows. We got all the necessary permissions and alerted our neighbours who were absolutely fine about living with scaffold for a few days. So four workers plus the boss, two lorries and a van arrived to start putting up the scaffold. I say start work, they only took one board and a length of pipe off the vehicles before the arguments started. The boss decided that we needed two towers not one because he wasn't happy with the cantilever arrangement he'd agreed to earlier. Mr FF pointed out the original scheme was feasible but the boss simply shouted from the balcony down 4 floors to one of the men 'You've done the course Joe, how far can we span it's a metre isn't it'. Mr FF again explained what could safely be done, we can understand no one wanted to take any risks here, but the boss wasn't having any of it and got a bit shouty, always a great response. Mr FF got cross too, 'I'm a chartered civil and structural engineer' he said, 'I'm a fellow of both professional institutions, I know what I'm talking about' apparently not as he hadn't 'done the course'. So work was abandoned, the boss said he'd get back to us that evening with a revised price and wouldn't let us down, that was Friday and the builder and lead worker were due the following Tuesday. As you might imagine we heard nothing whatsoever, we cancelled the lead worker. We're happy to be rid of the scaffold people, obviously dodgy if they changed their minds and wanted more money when they came to deliver but we did smile about them referring to the opinion some boy who has been on a course over a man with more than 40 years professional experience and enough qualifications to fill a suitcase. I'm thinking of getting Mr FF this t shirt, the one that says Trust Me I've done the Course just doesn't have the same ring to it. 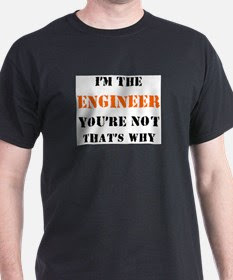 I should get Malcolm one of those - he's a chemical engineer, chartered engineer, and member of the institute of chemical engineers ....... that must qualify him for something! !